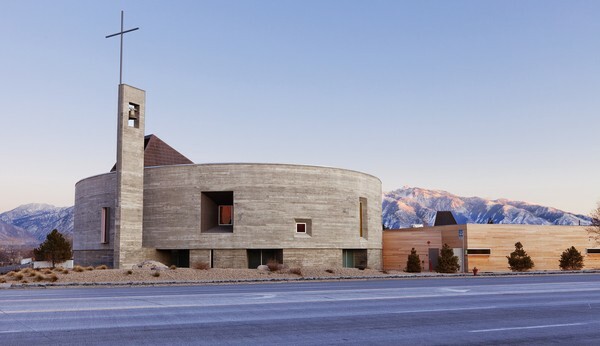 The history of the parish provided inspiration for the new design on this ten-acre site which incorporated tangible references to the community’s mining and construction past through the use of local materials and hand crafted construction detailing. The experiment at the heart of UNSCROLLED is to see what questions and ideas would emerge if 54 talented individuals each interpreted a single section of the Torah — the first five books of the Bible — and whether they could encourage others to similarly grapple with a text they may have strong feelings about without ever having read. This american church building is the result of a transformation of an existing metal shop building into a sanctuary and fellowship hall in anticipation of a larger adjacent sanctuary on the same site. The simple original structure is enveloped by a new skin, obscuring and refining the original gabled form. Set on a prominent, two-block site overlooking Oakland’s Lake Merritt, the 1350-seat cathedral is the centerpiece of a 226,000-sqft complex that includes a mausoleum, conference center, administrative offices, bishop’s and clergy residences, bookstore, café, and community-serving ministries. The building design gives special consideration to the Cathedral Center’s physical and cultural place within the city of Oakland. Within the cathedral, the experience of light and space, rather than traditional iconography, instills a deep sense of sacredness. The client is a rural Catholic Parish in South Louisiana with strong French influence. There are three buildings in the first phase of the Holy Rosary Complex – an administration building housing the administrative functions of the parish; the religious education building; and the oratory, or chapel for the celebration of the rites. The oratory is intended for the daily use of small assemblies, less than 50 congregants. The parish desired a relationship between the oratory, the existing church and for there to be a place of prominence for this chapel in the new complex of buildings. Gunnar Birkerts with Di Clemente Siegel Design Inc.